When you are in need of help with your oven cleaning job – call us and we will come to the rescue. Our company is a well-known and respected cleaning agency in Putney and the area and we are offering you to take advantage of the best oven cleaning service in the area. We are offering you not only the most efficient and convenient service but also the most cost-effective one. Our rates are incredibly practical and our services are of the highest quality. If do not just take our word for it. Call our company now and get a free estimate and enquire about our flexible packages are economical rates. Book our professional oven cleaning service and leave this time-consuming and back-breaking job to our specialists. They will degrease your oven thoroughly and will eliminate all bacteria. Be sure to choose our company for help and you will not be disappointed. Our professional oven cleaning services are done with attention to details and diligence. Our cleaners are qualified to efficiently scrub and degrease all types of ovens and materials – glass, cast iron, enamel, etc. And we can assure you that our cleaners will remove all grime and dirt from any oven, microwave, cooker, hobs, Aga or range oven, etc. Leave your oven cleaning job to our company and you will have your oven sparkling clean and ready to use immediately. We use eco-safe cleaning agents that do not leave chemicals in your oven. Our cleaners will degrease your oven inside and outside, cleaning hobs, door, trays and racks. All layers of grease and grime will be removed. Your oven will be deodorised and germs will be eliminated, leaving your oven healthy, clean and ready to use. Book our professional oven cleaning service and you will save yourself money on cleaning supplies and our economical rates and time. 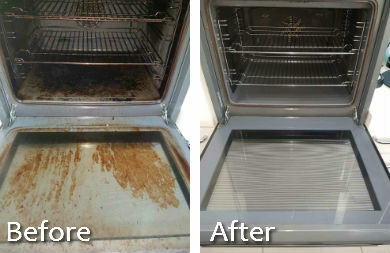 We are the best oven cleaning supplier in Putney.